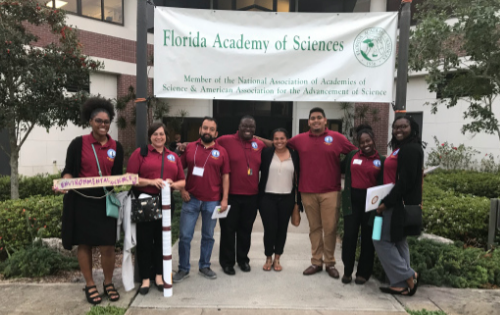 DAYTONA BEACH, FL- Bethune-Cookman University students in the College of Science, Engineering and Mathematics earned four top prizes at the Florida Academy of Sciences Annual Conference, hosted by Florida Institute of Technology in Melbourne, Florida. Bethune-Cookman University, founded in 1904 by Dr. Mary McLeod Bethune is a historically Black, United Methodist Church-related, private, coeducational, residential university offering undergraduate and graduate degrees. Located in the Atlantic coast city of Daytona Beach, Florida, the University’s main campus consisting of 66 academic, administrative, and student support buildings spans over 86 acres of land. B-CU offers 44 majors (36 undergraduate; eight graduate) through six academic Colleges: Business & Entrepreneurship, Education, Liberal Arts, Health Sciences,Science, Engineering & Mathematics,Global Online Learning, and four Schools: Hospitality Management, Performing Arts & Communication, Religion, and Nursing to award Bachelor’s and Master’s degrees.